My poor little blog has been neglected since April, but it’s time to get back at it. To be fair, there were a lot of crazy things happening, but I think I’ll get into that in another post. 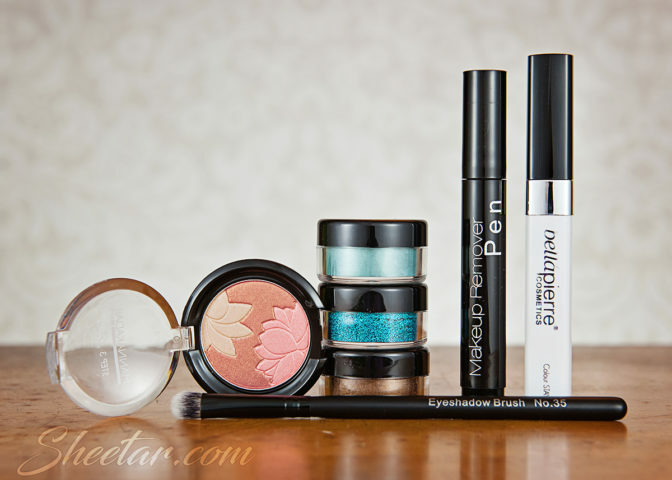 This post is about the first shipment from the Storybook Cosmetics Book Club! The first shipment was originally scheduled to ship in August, but there were a few delays, and this finally arrived on the 27th of November. There was clear communication on social media about delays the whole way along, so I’m okay with that. This being the first shipment, sometimes it takes a while to work out all the logistics and timing, and hey, it was well worth waiting for! 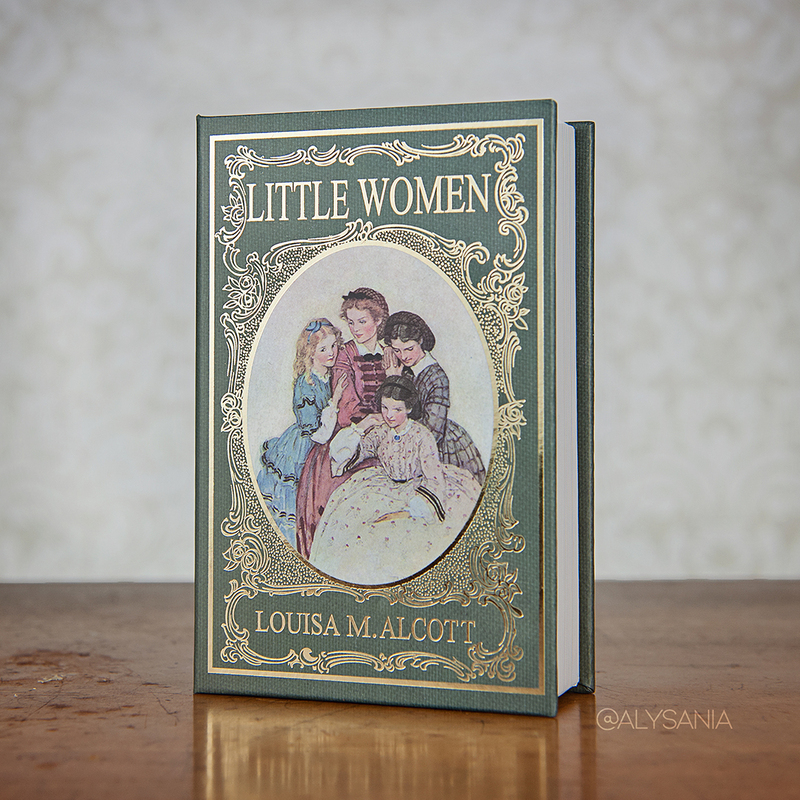 The first shipment is based on Little Women and is shaped like a book, complete with a dark green woven fabric printed book cover featuring gold lettering. Inside the book, there’s a mirror on one side, and three eye shadows and a liquid lipstick on the other. The eye shadow colors are Meg, Beth, and Amy, and the liquid lipstick is Jo. This is just so perfectly on theme! The packaging is gorgeous and sturdy with a magnetic closure. As for the eye shadow colors, Meg is a shimmery sage green, Beth is a matte tan, and Amy is a shimmery, plummy pink sort of color. The liquid lipstick is a deep raspberry shade – not a bright color, a good bit darker than my natural lip color, and it goes on much darker than it looks in the tube. I really do love the color though, and the formula goes on creamy without drying out my lips. It dries to a pretty long lasting matte finish. I’m definitely looking forward to the next shipment which, according to an update today, looks like will arrive in January. Honestly, I’d be okay with this being an every-other-month club since I could see it going to makeup overload pretty quick since those are all full-size products. The cost is $24.99 per month plus shipping which came out to a total of $28.99 for me. As far as a value goes, the liquid lipstick costs $14.00 on their website, and a 12 pan eye shadow book goes for $55, so it’s hard to come out with an exact value, but I’d say it’s right on target with their other products, plus, it’s a unique one-of-a-kind item that only goes out to subscribers which is always the draw of subscription boxes. Overall, it’s a stunning product, and I can’t wait for the next! Another Benevolent Beauty Box is here! April’s edition featured four items this time, but the one is basically a four-in-one by itself and is a huge item, so I’m perfectly fine with this! Let’s get into the contents. Bellapierre Colour Stay – .32 oz / $10 – (Full Size Product) It’s essentially an eye-safe glitter glue or primer that helps cosmetic glitter or shimmer eye shadow stick in place. I, um, I tend to use a good bit of cosmetic glitter, so this is great by itself, but it also goes well with the other products in the box. I think this is a touch thinner and easier to apply than the Too Faced glitter glue I love, so I’ll have to see how it holds up against the classic. Manna Kadar Blossom Floral Compact – 3.2 g / $29 – (Full Size Product) I don’t really use blush or highlighter, but it says this can be used as an eye shadow as well, so that’s probably where it’s going to go. The colors are pretty neutral between the light, pink, and bronzeish color, so it’ll work blended together or separately, no problem. Bellapierre Eye Slay – 1 set / $45 – (Full Size Product) I received the color, Mermaid Glam, which is going to be SO much fun to try out. There are three pots each with 2 grams of mineral eye shadow plus a brush. One of the pots in my set is a cosmetic glitter (the super bright blue one in the middle), so GLITTER! I’m definitely going to give this a whirl sometime soon. Overall the value of the box comes to $98 which is probably around the lower end of average for this box. The big item is that eye color set, and I’m glad there’s the Colour Stay glitter glue to go along with it. I’m kind of neutral on the Manna Kadar compact and the Makeup Remover pen, but they’re still items I’ll use for sure. As always, looking forward to next month! April’s Sephora Play! arrived this past week, and it was box variant #351. I’m WILDLY underwhelmed. I got a ton of anti-wrinkle products that the product sheet says were selected for my skin concern, but nowhere at all on Sephora’s website – not in the Play! Profile or in my regular Sephora Profile – do I ever list wrinkles as a skin concern. In fact, I rather love my little wrinkles. They’re badges of honor for all the times I’ve smiled and laughed, squinted and raised an eyebrow. I don’t find trying to stop the inevitable march of time a worthy effort when I can actually do something about dry skin and acne. It’s just silly to me. Anyway, so yeah, this box was basically a total miss for me because I DO NOT CARE ABOUT WRINKLES. Way off base, Sephora. The theme this month was, “Insta Beauty” which was all about getting a perfect selfie, but again, if you know me, I’m not going to all perfect up my face when I take a selfie in my beekeeping suit. I am who I am, and FWIW, sparkly lip gloss looks terrible on camera, so. I don’t even. *sigh* But hey, at least the bag isn’t culturally insensitive this month? Dr Dennis Gross Wrinkle Recovery Peel – 16 treatments / $88 – (Product is 2 packets, value of $11 by volume) A wrinkle product I don’t need, not to mention how it contains AHA and increases sun sensitivity while we’re working our way into Spring and Summer. This would’ve been way better in Fall or Winter, but nevermind that because I don’t even want this. I don’t want to ‘recover’ wrinkles that are just going to come back anyway – again, I’d rather work on my dry skin and acne than worry about things you can’t stop. Kiehl’s Line-Reducing Concentrate – 1.7 oz / $62 – (Product is .17 oz, value of $6.20 by volume) Another ‘wrinkle reducing’ creme that contains ingredients that make your skin more sun sensitive. Poor timing, and another poor choice for my profile. Straight to the give-away box with this too. Burberry Blush Eau de Parfum – 1.6 oz / $90 – (Product is .06 oz, value of $3.38 by volume) Oh gosh, this is hideous. I sprayed a little on the card and it’s just a mess of florals including my least favorite, Jasmine. Straight to the give-away box you go! Buxom Full-On Lip Polish – 4.44 mL / $20 – (Product is 1.5 mL, value of $6.76 by volume) The color I received is Celeste which is described as a prismatic soft peach. I have to tell you that I’ve never bought a Buxom lip product because I get SO many of them as samples, and I find the tingle a little off-putting. This is no different. Philosophy Purity Made Simple Moisturizer – 4.7 oz / $25 – (Product is .25 oz, value of $1.33 by volume) It’s a pretty basic moisturizer, though the first two ingredients are water and silicone, so, I’m not all that impressed right off the bat. For a moisturizer, I’d expect to see an actual moisturizing ingredient in there, but silicone is kind of an inert filler, not a moisturizer. Philosophy is also not cruelty free, so while this is basically the one product in the box I’d consider using, I’d never repurchase it since their parent company, Coty, engages in animal testing (they sell in China). Make Up For Ever Ultra HD Perfector Skin Tint – 30 mL / $36 – (Product is 5 mL, value of $6 by volume) The color I received is #6, Warm Sand, and it’s WAY off base for my skin tone. I fall somewhere between a light and fair, and this has some wild yellow tone to it that shows up as fake-spray-tan orange on my face. Another huge miss, not to mention that the company isn’t cruelty free anyway. Overall the value of the box comes to $34.58 which is about average. The cost is only $10.60 including tax and shipping for me, but my personal value here is basically zero. This box is pretty much a huge waste and I feel like I got a box intended for someone else since NONE of it matched my beauty profile. Hugely disappointed this month, Sephora. Hi Melissa, I hope you are doing wonderful today! I’m so sorry that the last box wasn’t all you hoped for. Thanks for your feedback and Pinterest board. They help tremendously! Ok so don’t poison me for sending you the same intercoastal print as what you got in your last box! 🙂 I just know you liked the print, just not in bell sleeve form so I had to have you try it in skirt form! Pair this skirt with the button down peplum top, tights and tall boots for a chic kinda casual/dressy look. You can also wear this skirt with the twist top for a chic feel. Both of these tops will pair perfectly with the camo jeans for a trendy but lightly edgy outfit. You can also add this vest for an added touch of flair and warmth. I can’t wait to hear what you think! With Joy, Cami. Well, it’s another mostly miss of a box, unfortunately. I did have a lot of fun digging through my closet to pair with the items in the box, but ultimately, this is again too far over the line into business casual or workplace wear. I work at home in my yoga pants and hoodies most of the time – I need less business casual and more “things I can throw on when going to the grocery store so it’s not always jeans and a t-shirt.” At this point, I’m not sure if any of these subscription services are at all geared towards delivering what I’m looking for since I keep getting miss after miss. Anyway, on to the contents of the box this month! So, Cami suggested that I pair the skirt and peplum top together which.. Oof, that’s a big old nope on my shape. I think the peplum top is too big to begin with (even though I changed my top size down one size after last month), and since my waistline is so high, the peplum covers nearly half the skirt. So, on to photo 2, I paired the top with a red belt to bring in my waistline, and added skinny jeans with the boots. It’s a little better, but the peplum cut just does my hips (already the widest part of my body) no favors. If I had a larger bust to balance out the peplum, I think it would work better, but.. Yeah, that’s not in the cards for me. It’s also white, which, I mean, this is me, we’re just asking for a pasta sauce spill or something incredibly awful to ruin that shirt forever after the first time I wear it. As for the skirt, it looked way better paired with a crop jacket to show off my waistline, and the cut is actually super cute, but.. it’s pink. *sigh* I have my profile set to avoid pink, yet there it is. The colors on the checkout sheet say, “Red and White,” but I’ll be damned if that isn’t fuchsia with pink stars. It’s also, again, too dressy, so even if I did get it in black instead, I probably still wouldn’t have kept it. Both of these go back. I know I went over my dislike of camo with Stitch Fix before. I just.. It’s not me. It’s not something I feel comfortable wearing. I’m not a hunter and I’m not in the military, and.. EHH. The fit was really odd, and you can’t tell it from the photo, but the ankles were REALLY loose – like, suddenly bootcut loose which was weird since they’re skinny jeans. The waistband was also really loose and had a bad gap in the back. So, between the print and fit, the jeans go back. Eeechhh no. I think the look on my face says it all. It was too big around the middle and even too big across my hips (again, despite adjusting my size down a notch in my profile), and WAYY too long. It’s also more preppy soccer mom than hippy grungeling, and was just such a huge stylistic miss here. I also need to confess that I never saw the point of puffer vests like this – they keep the warmest parts of your body warm, but it’s my arms and hands that end up cold, so I basically need the reverse of this? They just never made sense to me. The box merchandise total came to $382. Unfortunately, the only thing I’m thinking about keeping is the Kiyonna top, and after deducting the prepaid styling fee, it would only cost me an additional $38 to keep that top. It *is* a nice piece to add to my wardrobe, but something that nice, I might get to wear maybe 10 times a year at most, and I just don’t have a need for dressy stuff like that. I sort of wanted more casual, fun printed tops (nicer than a t-shirt, but not as nice as something you’d wear to an office job). Jeans are great, and colored denim would be fun! Crops, capris, destructed denim, etc. Maxi dresses, cotton blend dresses I can throw a jacket or cardigan over. I mean, I feel like there are options here, and all these boxes keep missing the target. I’m not sure what I’m doing wrong or if I’m not setting my profile up the right way.. Well, one more box until I give up on these altogether. Maybe it’s just not going to work for me at all anymore which is a bummer because I love the idea of someone else picking out clothes for me, but I can’t seem to land a stylist that gets me, and getting assigned a new one after a bad box means that no one has a chance to learn and adapt to make it work. In case you’re thinking about signing up and want to use my referral link, here it is!